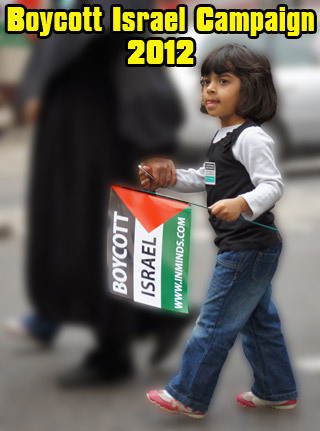 Boycott Israel News: Your Majesty Say No! 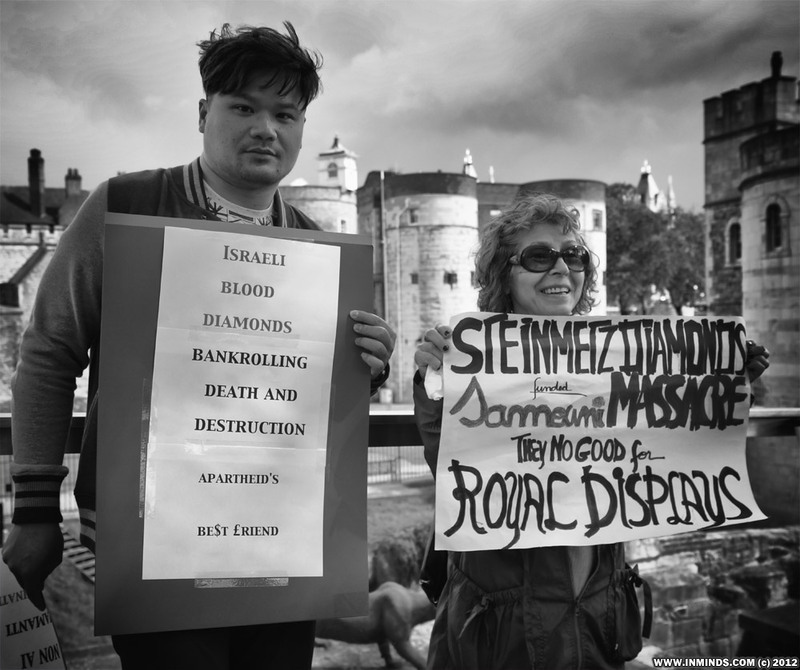 To Israeli Blood Diamonds In The Tower! 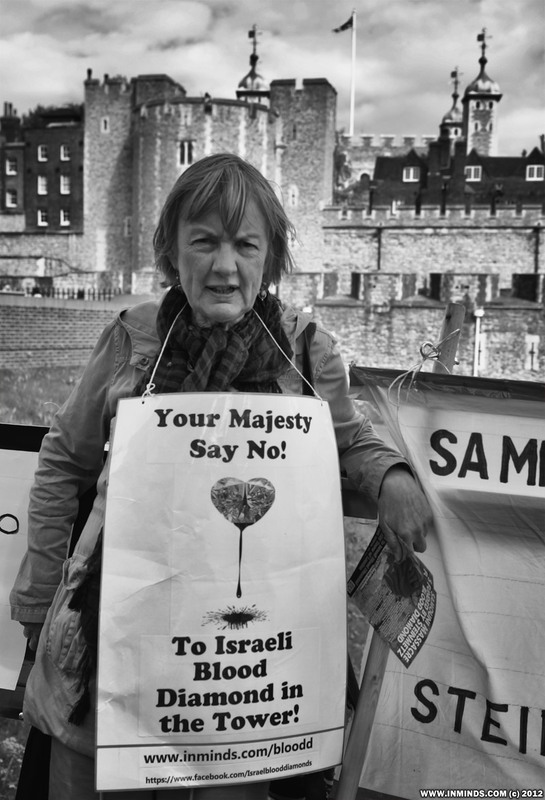 Message to the Queen: "Youre Majesty Say No! 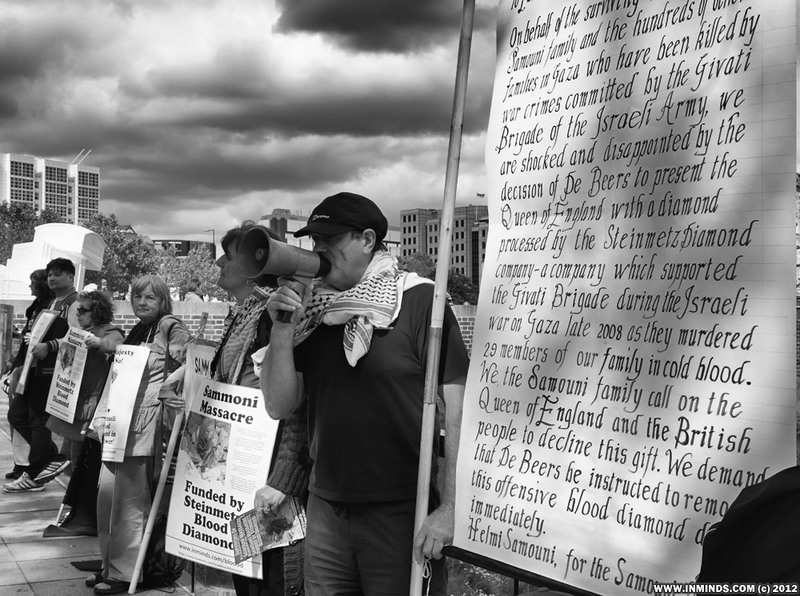 To Israeli Blood Diamonds In The Tower!" - but will she listen? 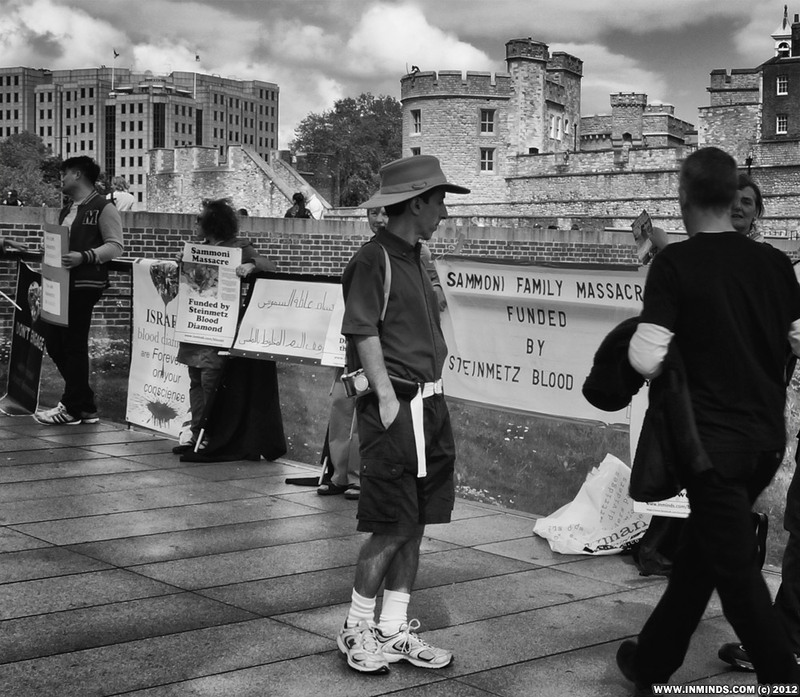 In the third protest in three weeks, human rights activist on Sunday 1st July 2012 gathered outside the Tower of London asking the Queen to remove the Steinmetz blood diamond from the De Beers Jubilee display at the Tower of London. 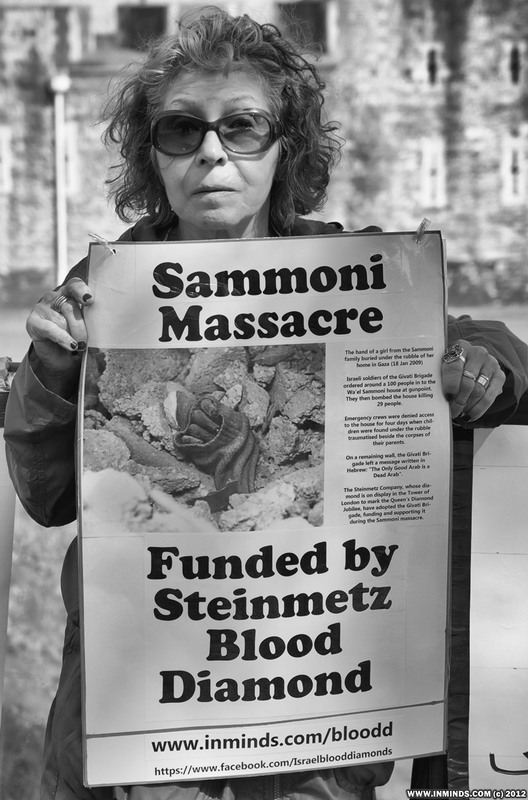 Israel's Steinmetz diamond company funds the notorious Givati Brigade of the Israeli army which is guilty of heinous war crimes in Gaza including the massacre of the Samouni family, murdering 29 members of the family including many children. 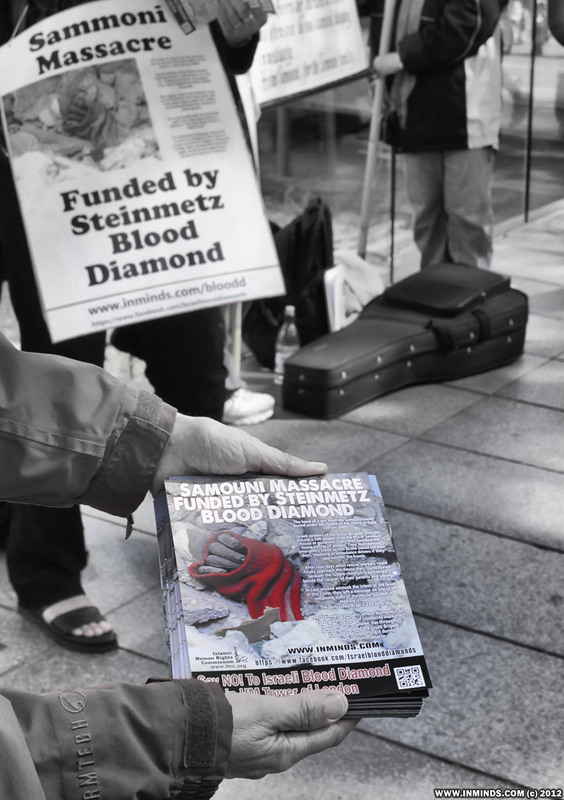 The surviving members of the Samouni family have asked the Queen and the British people to reject the blood diamond and remove it from display. For background information please see the coverage of the previous protests here and here. 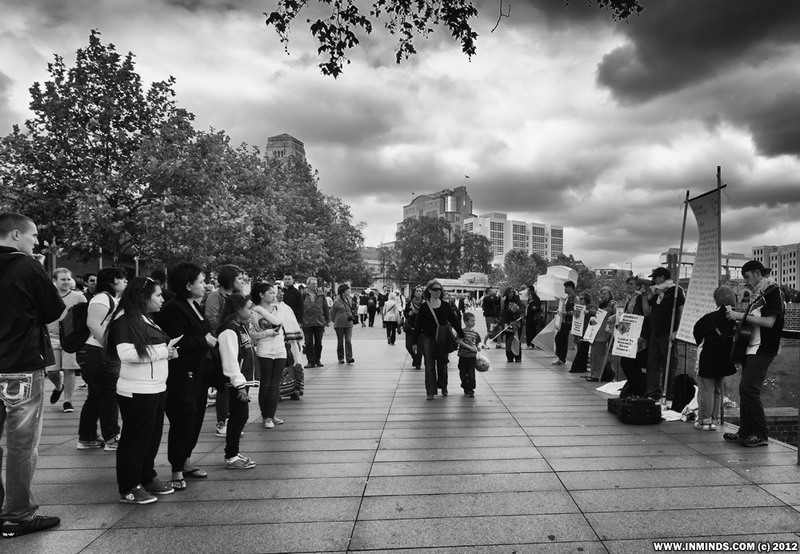 This weeks protest built on the success of the previous protests. 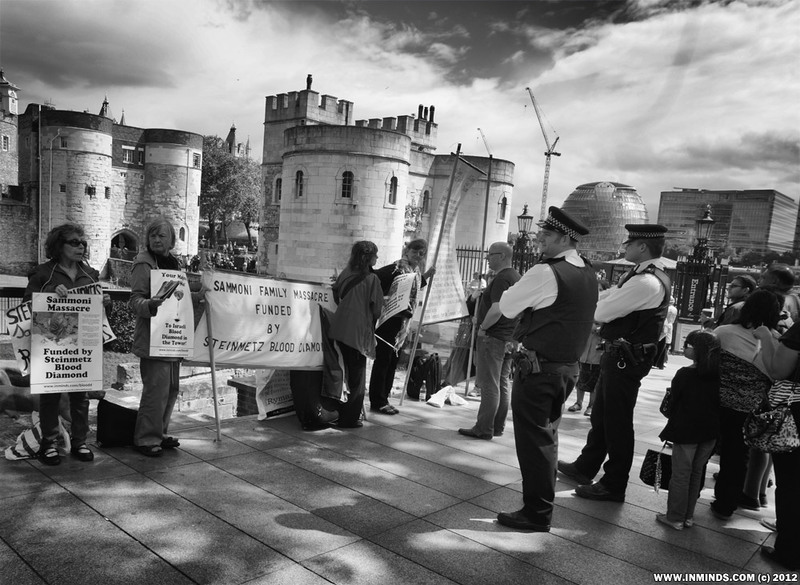 The police greeted us as we set up the banners, by now they were use to our presence and were very civil towards us, not causing any problems for us. 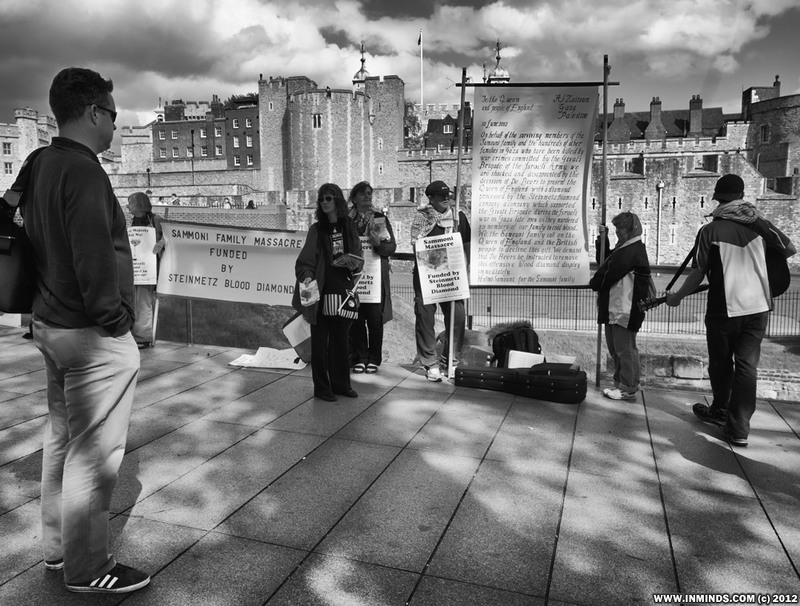 This was in sharp contract to the Queens private security which were rather thuggish towards us on out first protest. 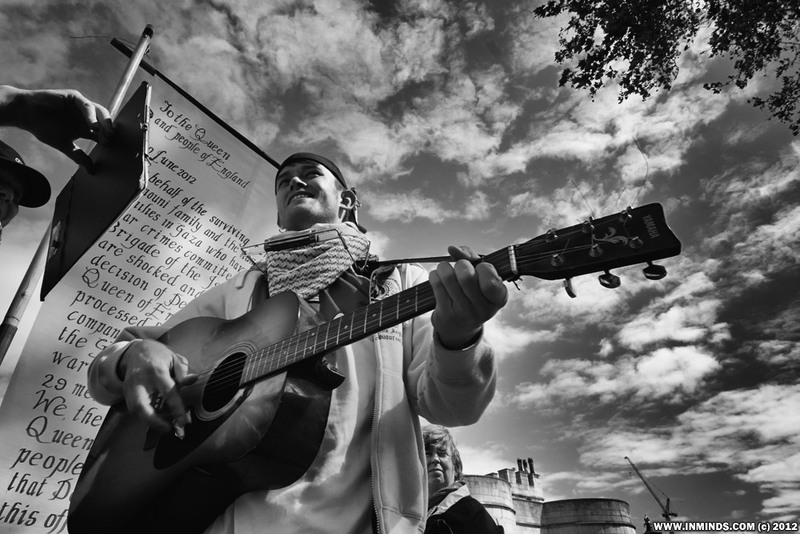 Our jewel to attract the public this week was a talented young Irish musician who sang wonderful Irish ballads adapted to the Palestinian struggle. He was a real crowd puller. 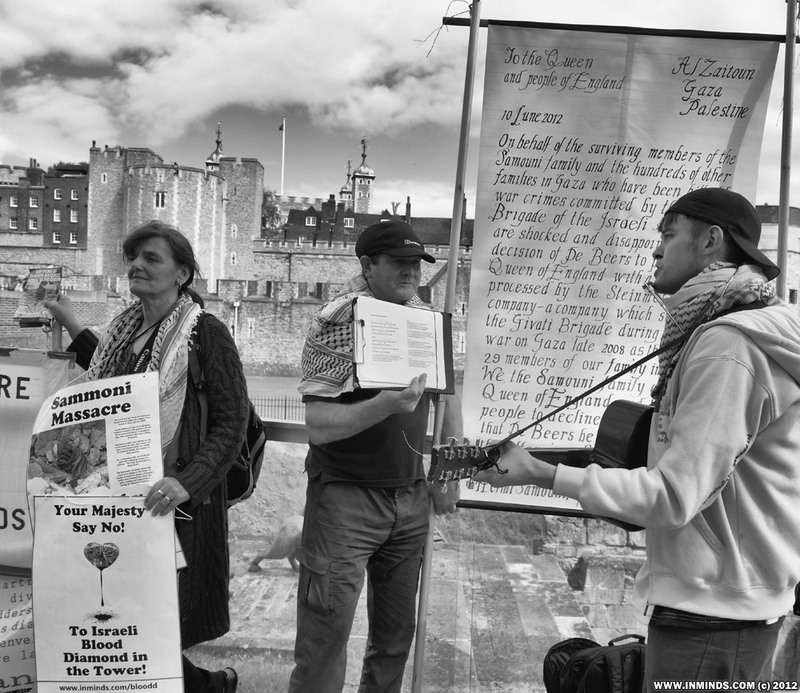 Fantastic Irish musician joined us, he sang Irish ballads adapted to Palestinian themes. 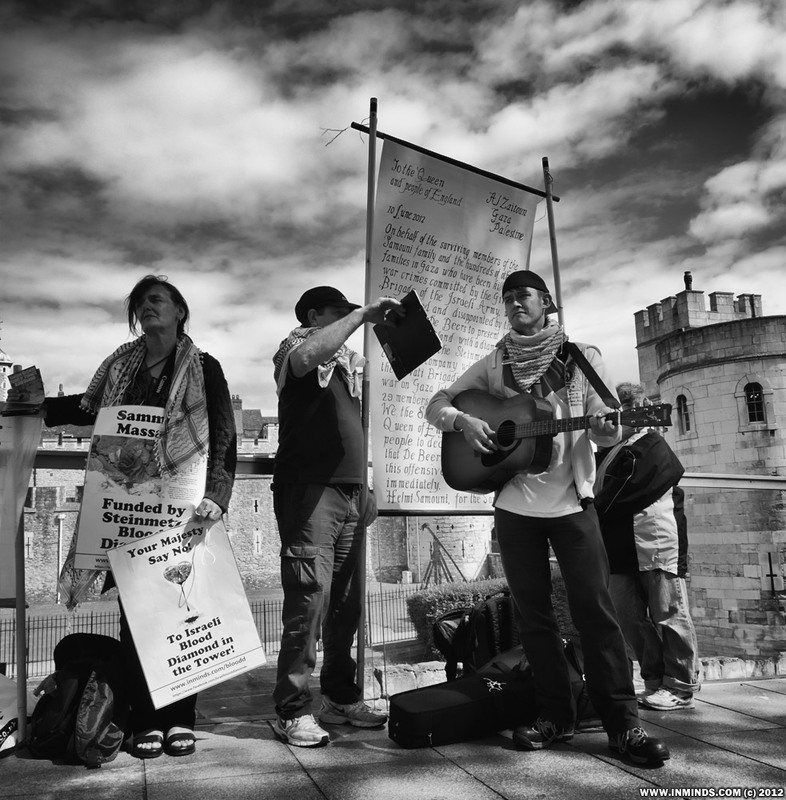 Irish musician joined blood diamond protest, he sang songs of resistance both about Palestine and Ireland. Irish music - a great crowd puller. We had several new banners this week. 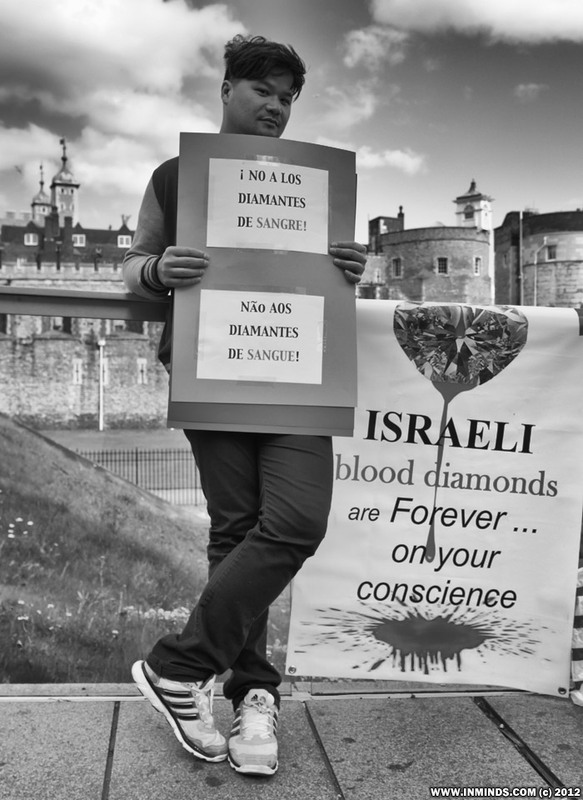 After encountering many European tourists last week, this week we had the core message of Israeli blood diamonds translated in several European languages. 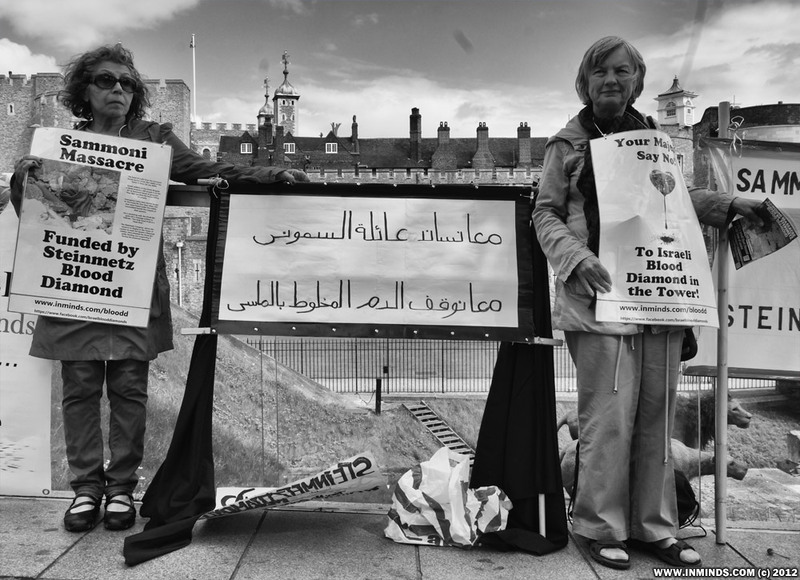 We also had a message of solidarity in Arabic for the Samouni family. 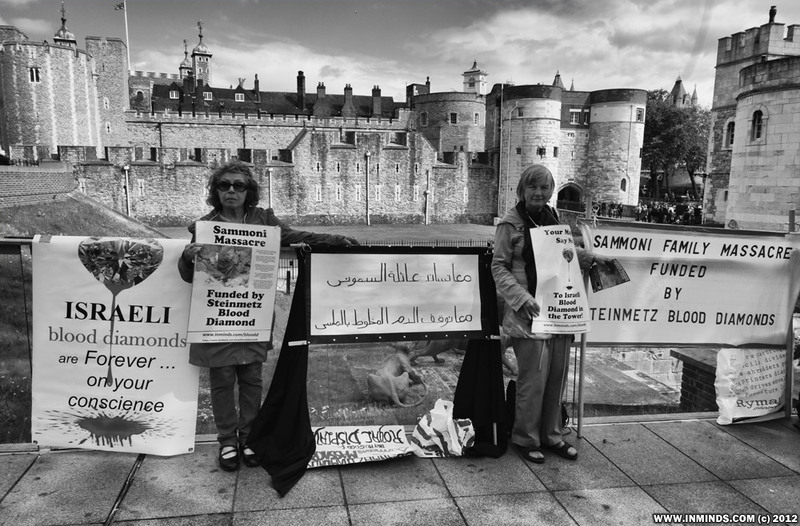 A message in Arabic for Gaza - rough English translation: "We stand with the Samouni family, remove the blood diamond"
With so many European tourists it was useful to have the basic message translated in to the major languages. 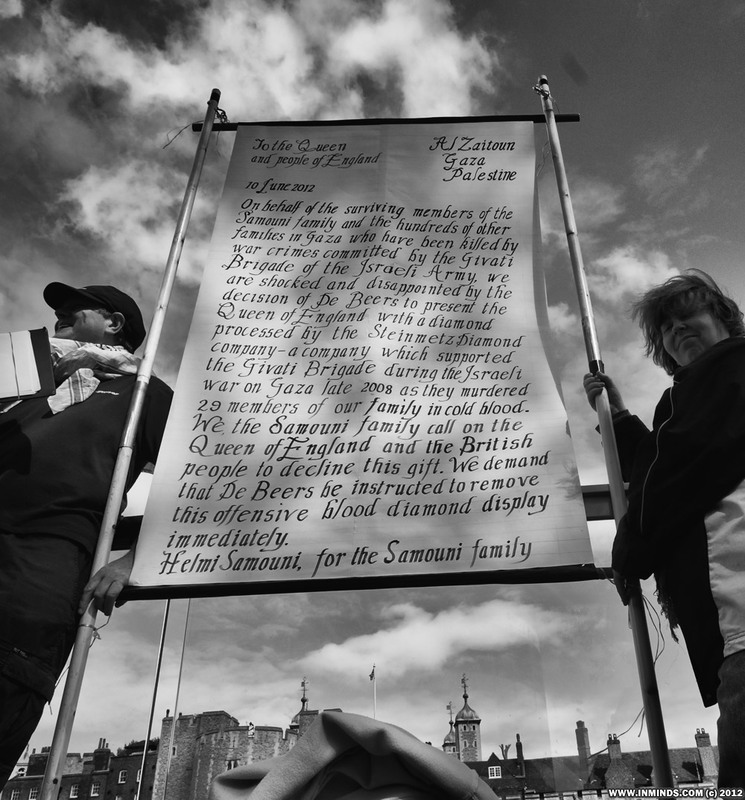 Even with all the new banners, the clear favourite with the public was the message from the Samouni family to the Queen. 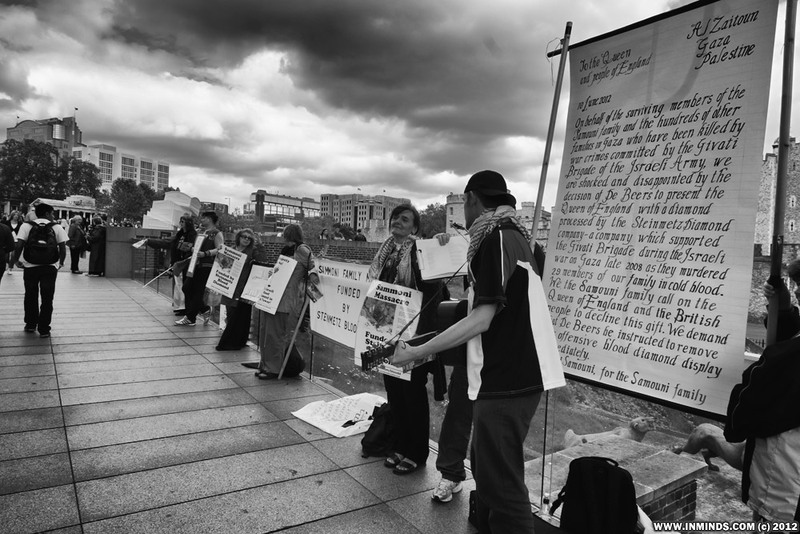 many people stopped to read the whole message, which is amazing when one considers the length of the message and the changing weather on the day. 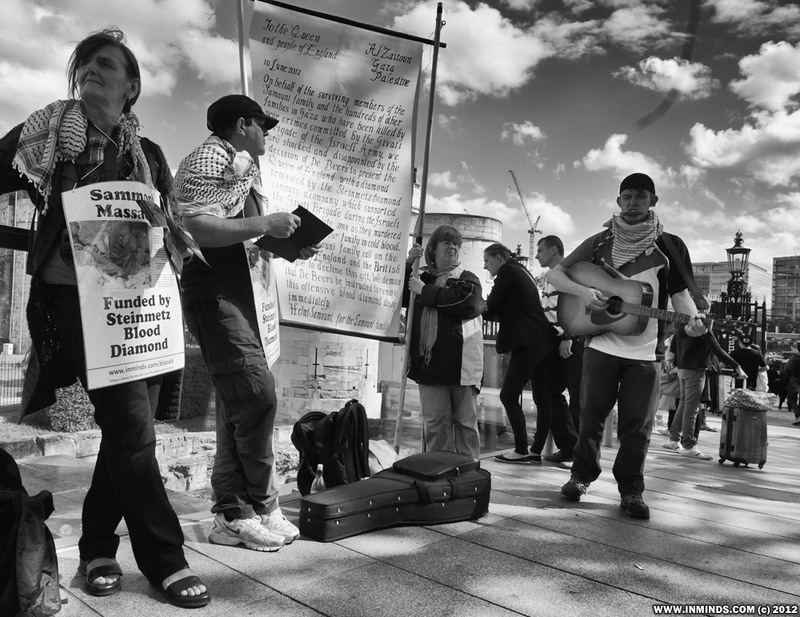 One person even came and complained to me that whilst he loved the music our musician was playing, the problem was that he was blocking some of the message which the person was keen to read! 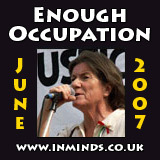 The decision had been made to print proper colour leaflets, an indication that the protest was here to stay the course. 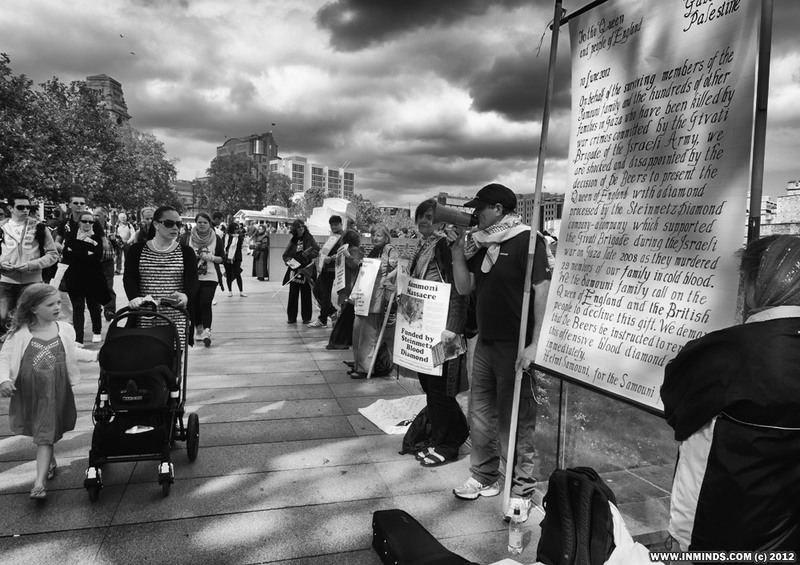 The leaflets proved very popular. 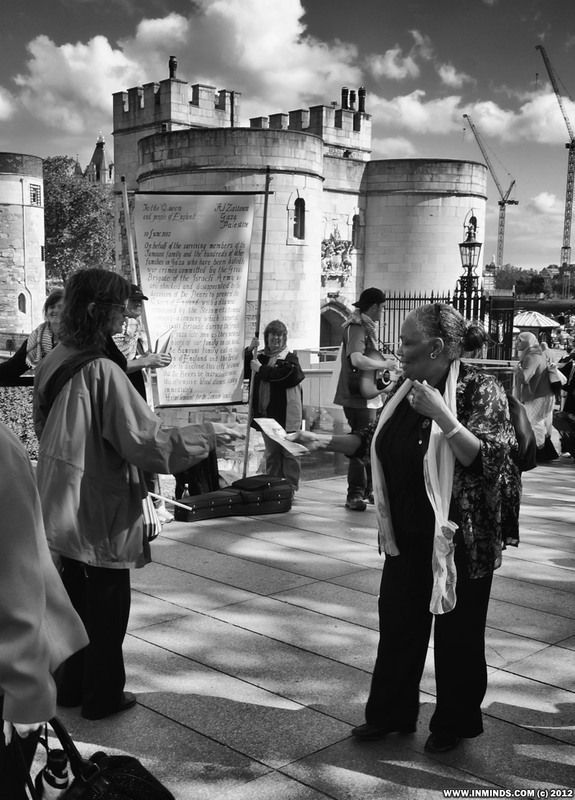 The best one can usually hope for when leafleting is that people will pocket the leaflet you give them, rather than bin it, and then hopefully they may glance at it once home. Not so at this protest, time and time again we saw people stop and read both side of the leaflet, once even coming back for further information! Clearly this injustice struck a cord with the public. 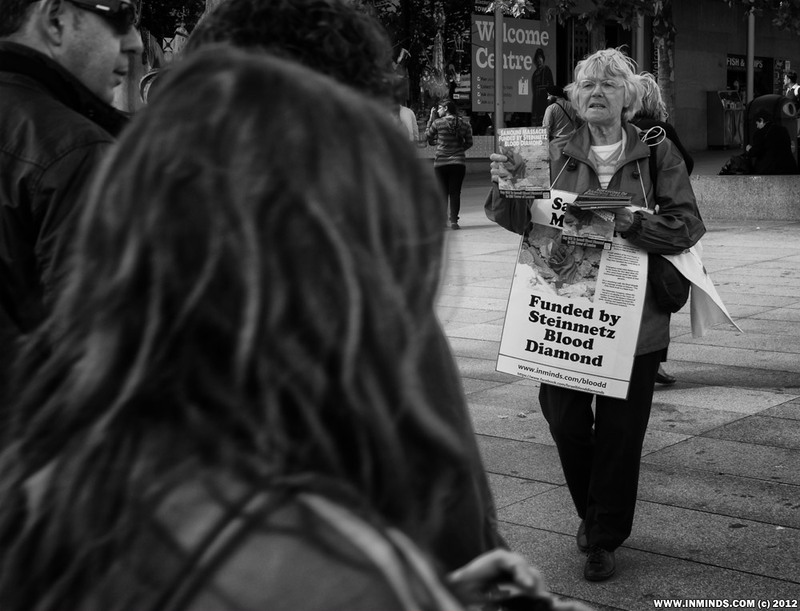 One tourist from the US explained that she was a teacher and asked for a leaflet to take back to her students to tell them about the Queens blood diamond.